All good things must come to an end and that goes for our winter break to South Carolina. We hoped to escape the cold northeast but cool weather followed us…. at least in the mornings. We enjoyed a few 70° afternoons and lots of 60-something afternoons, but it was brrrrr brisk at dawn. We’re talking temperatures in the 30’s! We are happy to be home tackling chores like the mountain of mail, pending commitments and greeting the grandchildren. All need immediate attention. Over morning coffee, we talked about working off the extra padding we both added to our waistline from tempting southern cuisines. Too many BBQ sandwiches and fried hush puppies was my downfall. Lots of seafood and sauces for mister gardener. There was one restaurant all three of us agreed was the best of our gastronomical journey…. The Santa Fe Cafe, billed as Innovative Southwestern Cuisine. And, yes, it was. Our son enjoyed the BBQ Chicken Taco and mister gardener tackled the Ribeye Burrito….both out of this world, they managed to say between bites. Unique, generous, and tasty. On the other hand, I had possibly the best soup and definitely the most artistic soup I’ve ever been served. It was almost too pretty to eat. Take a look at the Painted Desert Soup, half red pepper and corn soup with ancho chile cream. We recommend this restaurant and anything served on the menu. I really do think folks in New England eat a lot healthier than what sustained me in my southern upbringing. Sweet tea, something I had plenty of in SC, is not a thing up here. Good thing, really. Lots of fried foods, like all those hush puppies or all the calories in those grilled pimiento cheese sandwiches I ordered a few times won’t be served around these parts. Collard greens was generally on the menu in SC, always infused with the tasty grease from bacon. Yep, bacon, butter, salt. Oh, and Hellmann’s REAL mayo. Lordy…. 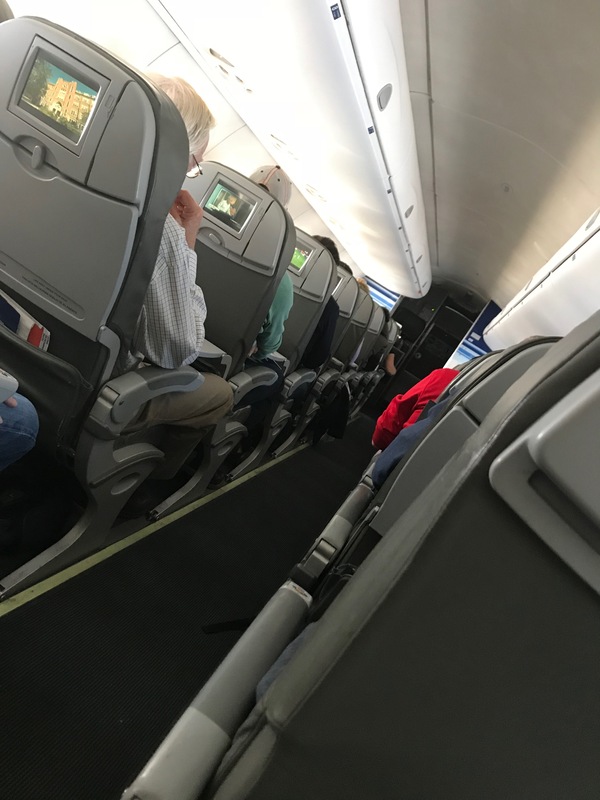 This entry was posted in Hilton Head Island SC, New Hampshire, Santa Fe Cafe and tagged cuisine, Hilton Head Island, Home again, Santa Fe Cafe, Southern Food by Annie. Bookmark the permalink. They serve a lot of crap here in Illinois. I’m glad i’m a vegetarian who is careful about what i eat. So, you can be careful about what you eat the rest of the year because I see nothing wrong with what you had on your menu. 🙂 That soup is a work of art. 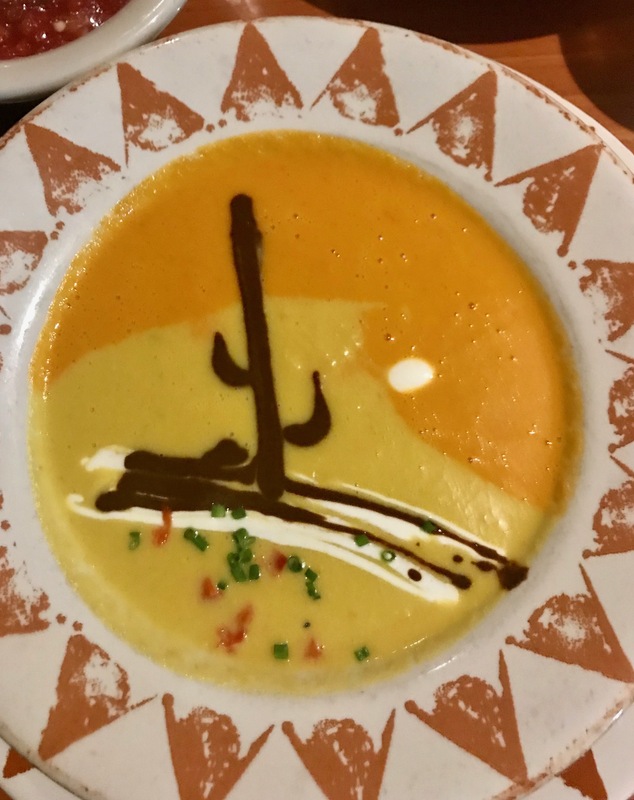 It is difficult to eat healthy while traveling, but that painted desert soup looks beautiful and doesn’t sound too unhealthy. The soup was delicious and we won’t think about calories. I’m back to eating healthy and going to the gym in New Hampshire.